Baxter and Halozyme announced the launch of Hyqvia (immune globulin infusion 10% [human] with recombinant human hyaluronidase) for the treatment of adults with primary immunodeficiency (PI). Hyqvia is the first approved subcutaneous immune globulin treatment approved for adult PI that requires only one infusion every 3–4 weeks (depending on established dosing regimen) and one injection site per infusion to receive the full dose. The immune globulin component is prepared from large pools of human plasma consisting of ≥98% IgG. It is comprised of a broad spectrum of antibodies and provides the therapeutic effect. The recombinant human hyaluronidase component enhances dispersion and absorption of the immune globulin infusion. 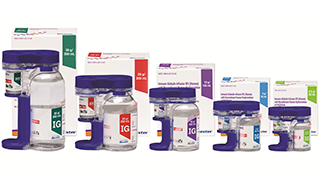 Hyqvia is available as a dual vial unit of 2 single-use vials containing the active IG 10% and recombinant human hyaluronidase: 2.5g/200 Units, 5g/400 Units, 10g/800 Units, 20g/1600 Units, and 30g/2400 Units. Shipments of Hyqvia have begun. For more information call (866) 888-2472 or visit Hyqvia.com.